The new phablet from Samsung could receive camera upgrades and an octa-core CPU. A couple of years ago, when the Galaxy Note series made its debut, gadget enthusiasts were more than skeptical in regard to the “phablet” concept. As it turned out, the original Note has been a tremendous success, despite its oversized dimensions. In fact, the handset’s large display has been its strongest selling point, specifically when coupled with a stylus and various applications tailored for the S Pen. One could say that the original Note has paved the road for other similar devices. During the past several months we’ve learned that a handful of other smartphone manufacturers intend to join this particular market segment. Sony took it up a notch with the 6.4 inch Xperia Z Ultra, and rumor has it that HTC is working diligently on the so-called “HTC One Max.” That being said, phablet fans are looking forward to the launch of the upcoming Galaxy Note 3 more than ever – now that it’s bound to face some serious competition. Although little has been confirmed about this device, there has been a constant flow of leaks and rumors regarding its specifications. Today, we are going to dive, once again, into some of the more recent bits of information. It’s pretty obvious that, nowadays, a smartphone’s camera is a really important feature. Developers are pushing the technology forward with each new device, and earlier this year, the concept of the “camera-centric smartphone” gained a lot of steam. Although the sensor fitted on the Samsung Galaxy S4 is quite decent, fans of the series have been somewhat disappointed by the lack of Optical Image Stabilization (OIS). As such, Samsung enthusiasts have turned their attention toward the Note 3, hoping that it will fill the void in this regard. The good news is that a DLNA certification for the Note 3 has been recently leaked, revealing that the handset’s camera will feature OIS. The bad news, however, is that shortly after the DLNA certification was spotted, new reports surfaced suggesting that Samsung’s suppliers can’t deliver enough OIS-capable modules. These reports indicate that Samsung may be forced to delay the arrival of OIS, and that the Note 3 will probably not benefit from this type of technology. On the bright side, the Korea Economic Daily has recently reported that the Note 3 will offer 4K (3840 x 2160) video recording capabilities. It remains to be seen whether or not this will be a feature that makes it to market. Camera aside, there has been a lot of buzz around the Note 3′s internal hardware. So far, most sources seem to agree on the idea that the device will feature a 5.7-inch Super AMOLED display with a resolution of 1080 x 1920, 3GB of RAM, expandable storage and Android 4.3 out of the box. Nevertheless, there are many theories that have been passed around, concerning the handset’s storage, CPU, and battery. Some sources claim that the handset will be offered with 16, 32, or 64GB of built-in storage. Another theory implies that the 16GB model will be scrapped altogether, with choices being limited to the32 or 64GB models. 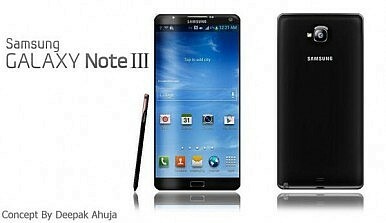 There is also the idea that the Note 3 may be offered in two main variants. One will allegedly be powered by an Adreno 330 GPU and a Qualcomm Snapdragon 800 processor clocked at around 2.3 GHz. The other variant would supposedly feature an Exynos 5420 Octa CPU clocked at 1.8 GHz, coupled with an ARM Mali-T628 MP6 graphics chip. According to reports coming – once again – from Korea, the first 4 million Note 3 units will be powered by the Snapdragon 800 quad-core SoC. After the initial launch, 20 to 30 percent of the Note 3 units will end up being powered by the aforementioned Exynos 5420 Octa processor. As expected, the SD 800 variant will boast 4G LTE connectivity, while the Exynos model would be limited to 3G speeds. Sources also seem to somewhat contradict each other when it comes to the phablet’s battery. Although some rumors suggest that the Note 3 will be powered by a 3,200 mAh unit, other theories have brought a 3,450 mAh unit into the equation. As always, we can’t be 100 percent sure that these rumors are going to become a reality. The good news is that we won’t have to wait for too long to get our answers. As many of you should know, Samsung has already confirmed that it will hold this year’s “Unpacked” event next month in Berlin. The Korean manufacturer has strongly hinted that the Note 3 will be present at the conference, inviting everyone to “Note the date” (September 4). This places us roughly one week away from the moment of truth, and I can almost feel the excitement hovering in the air. Until the Unpacked event goes live, we’d love to hear from you. What are your expectations concerning this particular device? Share your thoughts below. Vlad Andrici is editor for gforgames.com and writes about technology issues. Follow Vlad on Google Plus. Both super-sized handsets offer high end performance, but plenty of differences remain. How Can Kazakhstan Revitalize Its Civil Society?Laos Deports 3 Detained US Missionaries, Evangelical Group ClaimsAn Oil Discovery Before Systemic Reform in Pakistan Would Be a TragedyIndia Approves Procurement of 464 T-90MS Main Battle TanksWill Russia Build Borei B-Class Ballistic Missile Subs?